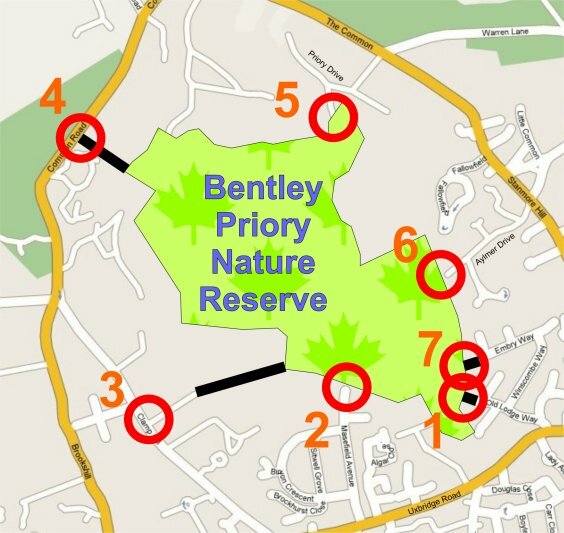 Bentley Priory Nature Reserve is the best known of the sites we maintain. It lies north of the Uxbridge Road and northwest of central Stanmore. The post code is HA7 3LY. The easiest access from central Stanmore is via Old Lodge Way, but there are a number of other entrances as indicated on the maps below. Originally one space comprising the house and grounds of Bentley Priory, a stately mansion built in 1775 with the distinguished and unorthodox Sir John Soane as architect, the two were separated when the house was occupied by the RAF and used as an operation centre during the Battle of Britain in the Second World War. With the sale of the house and its immediate grounds to a developer there are hopes that parts of the house will become open to the public. The land south of Bentley Priory house now forms the nature reserve. It is open all year round and welcomes all visitors, human and wild. All types of visitors will find something to interest them here. Two hard surfaced paths are suitable for strollers and outdoor wheelchairs: the Deer Path, which runs north from Old Lodge way gate to Priory Drive gate, and the Weald Path that runs west to Weald gate. These paths form part of the Bentley Priory Circular Walk. The grassy spaces and open glades adjacent to these paths afford many possibilites for picnics and sunbathing, while more adventurous visitors will see many uncommon plants and animals in the quieter areas. All that we ask of visitors is that you treat the site with respect – that includes not dropping litter, not picking flowers, not lighting fires, not damaging trees or fences, and keeping dogs under control. Version suitable for smartphones can be accessed here - or by QR tags on the posts as you walk the trail. This is the most complete version of the guide. Text version suitable for printing and taking along with you, but without maps or illustrations. 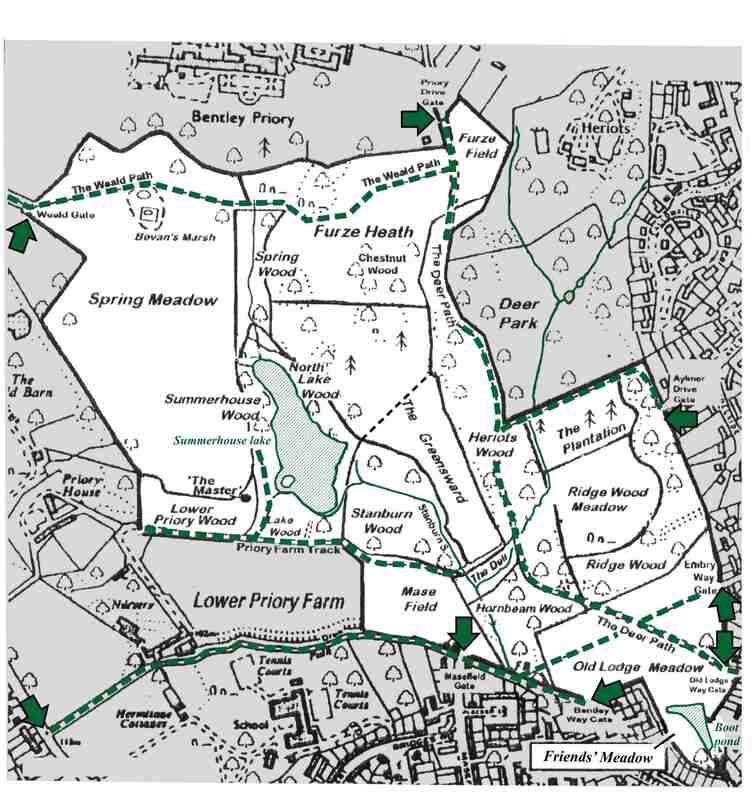 Full PDF copy of leaflet, with maps and illustrations - but note this is intended to be printed on A3 paper; if printed on A4 text size will be very small. The 66 hectares of the reserve slope southwards from the edge of the Stanmore Hill ridge in the north. The lower part is London clay but as one climbs north the clay is overlayed by the pebbly Claygate beds with a cap of quaternary gravels on the ridge. This rapidly draining soil supports heathland vegetation where gorse thrives. When water trickling down through the gravel reaches the clay a number of springs emerge and form streams. The name Bentley is thought to derive from the Anglo-Saxon words beonet, a place covered in coarse grass, and leah, a piece of cleared ground on the uplands. These words imply open space and traditional grassland, which remain a feature of the reserve today. A monastic settlement occupied the site in the 13th century, but was demolished. Bentley Priory house was the home of the Dowager Queen Adelaide in the 1850s. The reserve is a patchwork of woods and open grassland within which lie two bodies of water, Summerhouse Lake (named for Queen Adelaide’s lakeside gazebo) and Boot Pond. Heriot’s Wood is ancient, that is, it has certainly been a wood since 1600 and probably ever since the last glaciers retreated. Many of the trees here are hornbeam, a species that is characteristic of ancient woods. To the west of Summerhouse Lake stands the “Master”, a mighty oak at least 500 years old. The open grassland is “unimproved”, meaning that it has never been treated with fertilizer and hence, paradoxically, is rich in wild flowers. It has been designated a site of special scientific interest (S.S.S.I.) by English Nature. The dominant grasses are common bent-grass, red fescue and yorkshire fog. Wild flowers include uncommon species such as greater burnet saxifrage, great burnet, spotted orchid, betony, devil's-bit scabious and harebell, plus sanicle in the woods. A herd of cows grazes the grassland in summer to maintain the pastures and promote the diversity of wild flowers. Many interesting and relatively uncommon birds can be seen or heard including buzzard, spotted flycatcher and bullfinch. In summer warblers such as whitethroat, garden warbler, blackcap, chiffchaff and willow warbler can be heard. These breed in the scrubland in Spring Meadow and are rarely seen in the mature woodland. In winter, large numbers of redpoll, siskin, redwing, fieldfare and goldcrest arrive from mainland Europe and Scandinavia. 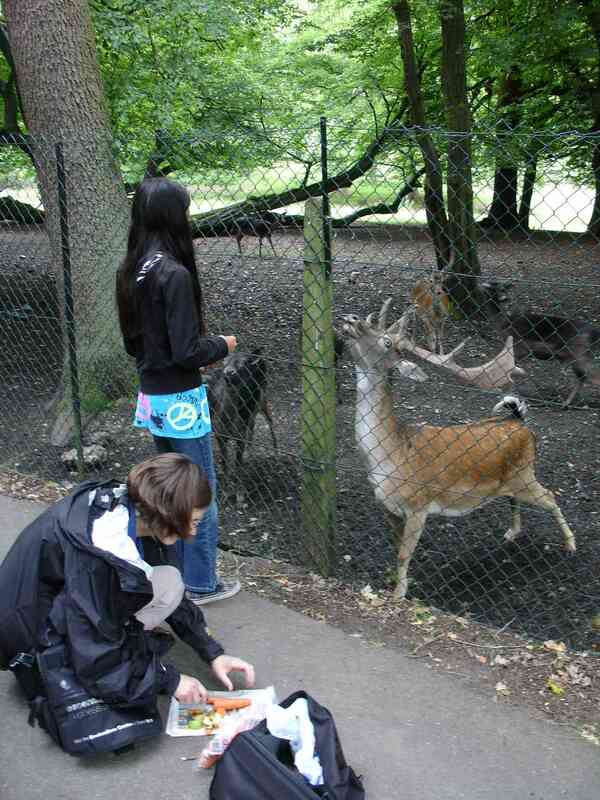 To the east lies a private fenced park which has a small herd of fallow deer. 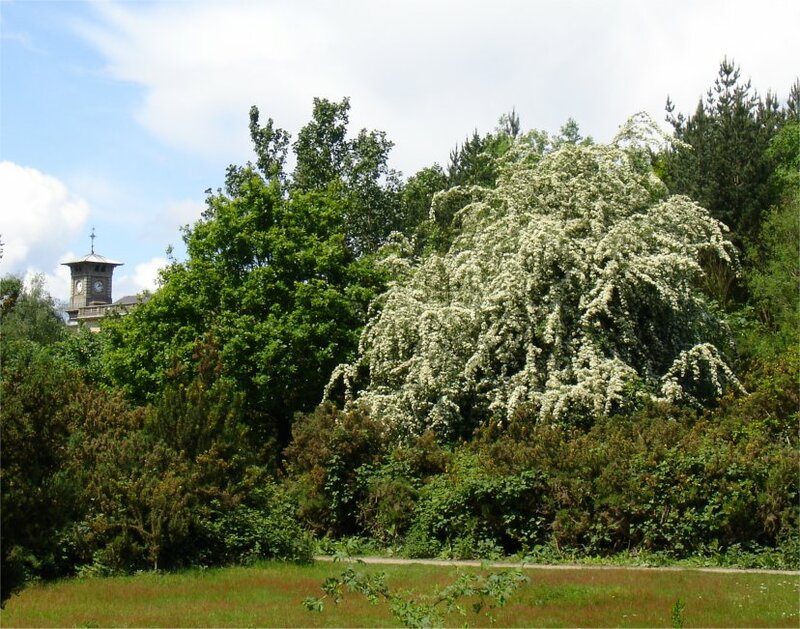 Work to improve Bentley Priory has been funded by Harrow Council's Green Grid initiative - click here for more information. 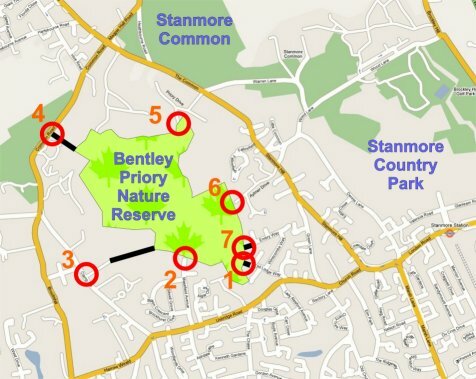 On the left is shown the area around Bentley Priory Nature Reserve to show the walking route from Stanmore station (Jubilee line). Buses 340 and H12 run along the Uxbridge Road/Church Road, 258 along Brookshill/Common Road, and 142 along The Common/Stanmore Hill (Map modified from a Google Maps original). On the left are shown access points to the reserve in more detail. 3: Unpaved road from Clamp Hill then footpath, skirting Lower Priory Farm. 4: Path from Common Road. This provides convenient access for walkers coming from Harrow Weald Common on the west side of Common Road. The meeting point for working parties is the Stanmore Common car park, off Warren Lane, close to the Priory Drive stop on the 142 bus. From there we will walk or take transport to the work site. The meeting point for guided walks andother educational and fun activities is entrance 1 on the map, at the north end of Old Lodge Way.